To give your cards a little scent, mix 1 teaspoon unsweetned (sugar free) drink mix like Koolaid to every 1 1/2 teaspoons of clear embossing powder to get your scented powder that you will heat. All you do is stamp your image with VersaMark ink on your card stock ( a solid image works best ) and then sprinkle on your scented embossing powder, shake off excess and heat with an embossing heat tool. You can also use a powdered sugar free coffee creamer, unsweetened (sugar free) cocoa or a spice like cinnamon or oregano. You could come up with all kinds of scented cards this way! What fun! I haven't tried any other scented cards yet. Just the Lime, Orange and Lemon scented one using Koolaid. I think a chocolate scented card would be yummy! What about a scented hot chocolate card? Or peppermint? Especially when it gets closer to Christmas! I'll have to give those a try. Thanks for stopping by! I hope you enjoyed this card! 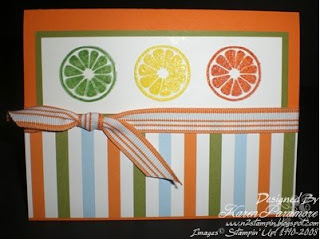 I love this with all the different citrus colors. I think this set is one of SU's better ones in a while. Thanks for the instructions on smelly cards for those who cannot attend the class. I will be sending one to "my" Karen in Texas - she'll love it. 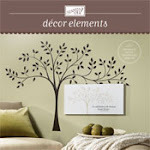 I'm way impressed with the site! Not only are the cards cool and fruity, but we had lots of fun learning to make them with you, too.